Earrings with hoop designs are popular, timeless and a must-have in every jewelry collection. 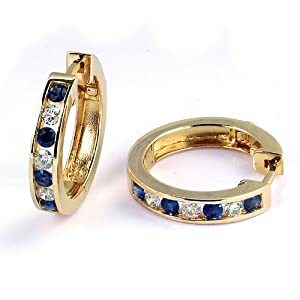 So, if you're looking for one, the ½ Carat Channel Set Diamond and Sapphire Hoop Earrings are a great option. These earrings are adorable with the combination of sparkly white diamonds and dramatic deep blue sapphires. The ½ carat diamond stones in 14 karat white gold make this pair even more special. These earrings are perfect to wear every day or as gifts for loved-ones.